On Sunday, a vote organized by the Occupy Central leaders, which was supposed to have gauged support among demonstrators for student negotiators seeking political concessions from the government, was abruptly called off. This was widely viewed as a sign of tension and confusion among protesters over how to sustain the movement after over five weeks of protests. Not only have divisions arisen in the pro-democracy camp, but also voices within Hong Kong speaking out against the protests and calling for law and order to be resumed have been mounting. The Occupy Central movement has lasted for more than one month and its goals are clear-cut. As well as having the change of the Hong Kong government on its agenda, it also attempts to cause chaos in the whole of Chinese society, deteriorating China's political environment. International forces that are hostile to China keep beating the drum for the protesters, offering them covert financial assistance and other aid with the purpose of moving the Occupy Central into violence and extremism. If we cannot curb this trend, bloodshed deliberately instigated by external forces will be unavoidable. Democracy has only prevailed in Hong Kong for over 20 years. There was no democracy during the century and a half of Britain's colonial rule. The Basic Law that was passed in 1990 is of epoch-making significance in Hong Kong's democratic development, in that it not only legally defines the relationship between the central government and the Hong Kong Special Administrative Region (HKSAR) government, but also formulates a framework for Hong Kong's democratic politics. Based on the Basic Law, the August decision by the Standing Committee of the National People's Congress allows Hongkongers to elect the chief executive from a school of candidates put forward by a nominating committee. This is an embodiment of the principles of "one country, two systems" and "Hongkongers governing Hong Kong." However, Hong Kong's pan-democracy camp negated the reform plan under the excuse that it's not in accordance with the "international standard." They launched radical campaigns such as the Occupy Central and boycotts of classes, blackmailing the central government with attempts to paralyze Hong Kong's order and economic development as well as create social and public opinion pressure. Those illicit acts have posed a direct threat to China's Constitution and the Basic Law. Hong Kong is a part of China under the principle of "one country, two systems." Occupy Central is neither legitimate nor moral. The so-called international standard leaves people perplexed as it's unknown whether it refers to the British standard, the US standard or other standards in regions like Tunisia, Libya and Ukraine. Democracy is an approach of governance by having majority rule but also respecting the minority rights. Its essence lies in compromise between the two sides under the rule of law. Abusing the rights of democracy for the interests of a minority is not excising democracy, but populism. This is the status quo of Western society, especially the US, where the Democratic Party and the Republican Party fiercely struggle for partisan gains at the cost of the national interests, and neither will concede. The Occupy Central in fact is inclined to implant the Western standard in Hong Kong. But as shown in other regions like Libya and Ukraine, the result of kidnapping public will and blindly chasing a democratic model while neglecting one's own situation is chaos, both politically and socially. It's been reported that Tai Yiu-ting, one of the leading Occupy campaigners, has been funded by the US National Endowment for Democracy and its subsidiary the National Democratic Institute, and another key figure in the pan-democratic camp Lai Chee-ying has connections with US neoconservative representative, former deputy defense secretary Paul Wolfowitz. Some pan-democrats have sacrificed Hong Kong's stability and prosperity for their political ambition. The economic prosperity of Hong Kong in the past half century has been based upon political stability. But the situation is confronted with unprecedented challenges. 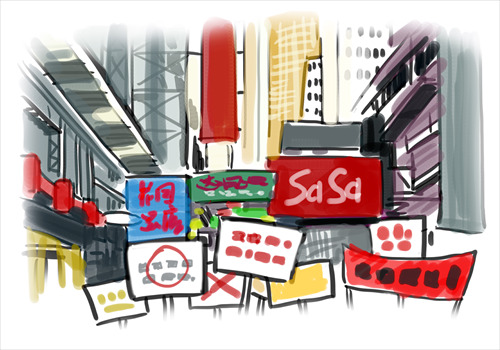 Occupy Central has severely affected the Hong Kong economy and the daily life of citizens. It has also squashed the confidence of many Hongkongers over the long-term prosperity of the city. Occupy Central is a backsliding of democracy in Hong Kong. Given its illegal and immoral nature, it's doomed to failure. The Occupy protesters won't cease until the HKSAR government resorts to harsher measures. In the end, the region's stability, economic growth and international reputation will suffer most.